Witcher developer CD Projekt Red has teamed up with R.Talsorian Games, makers of the pen and paper role-playing system Cyberpunk 2020, to create a new Witcher tabletop game. It seems like every day we're hearing about another major piece of Witcher news. In addition to a recent massive patch and the announcement that the final free DLC will be the addition of a New Game Plus Mode, CD Projekt Red has now announced a partnership with R. Talsorian Games to create a new Witcher pen and paper tabletop game. 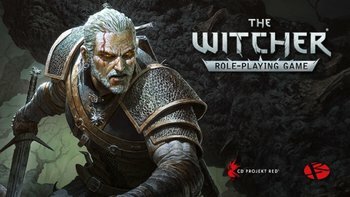 "The Witcher Role-Playing Game will allow tabletop RPG fans to re-create an array of characters known from the Witcher universe and live out entirely new adventures set within the world of Geralt of Rivia," wrote Community and Website Coordinator Marcin Momo in a forum post today. "Powered by Fuzion, the same ruleset that made Cyberpunk 2020 gain worldwide player acclaim, The Witcher Role-Playing Game will feature a myriad of spells, rituals, and curses; favorite gear and items from the entire Witcher series including a bestiary of devilish monsters players can face during their adventures." "The system will provide all the necessary tools to create and play out your own adventures and become everything from a battle-hardened monster slayer to a merchant kingpin controlling a vast network of contacts." The game is slated for a mid-2016 release. More details, including price and availability, will be available at a later time.